This page provides information relating to the United States Postal Service delivery of your package as well as other common issues. What does my package look like? Does my package say NoseSecret anywhere? We strive to ship all orders the same day . However, some orders that require manual verification may delay the shipping process. In order to make sure that you receive your package on time please whitelist emails from customercare@nosesecret.com to receive notification about shipping updates or information request. .
After placing your order, our fulfillment team makes sure that your order is properly verified to avoid shipping delays or unauthorized charges. - Waiting for Fulfillment: Awaiting for fulfillment means that we have received your order but it is in queue for verification. Most orders from the United States are automatically verified so they are shipped the same day from Monday through Friday. - Manual Verification Required: All orders under verification will be processed after we receive your reply via email. * You paid for your US order with credit card but the shipping address does not match the address registered with your credit card company. * You paid your order using Paypal but the address on your order does not match the address on Paypal account. *You paid with a non-United States credit card so we may not be able to automatically verify authorization from card holder. Please, Be aware that when you place your order we do not have access to your credit card details. If you would like to save time, you can enter in the "comment/instruction" box at check out: first 6 digits (ONLY) of credit card , name on credit card and address associated with credit card account to allow us to speed up manual verification process. If this information is not provided as indicated, you will recieve a friendly email with the request. The information we require is confidential and it is used solely for verification purpose. If you are unable to provide this information you can request cancellation of the order or contact us for addtional alternatives. * You are a first time buyer and placed an order on a single pair. Since single pair purchase are not covered with the return/exchange policy we need your confirmation about understanding the policy or allowing to change your order for a Nosesecret kit to be covered by the return policy. - Awaiting for shipment: Your order is ready to ship at the end of the day. - Pending: We have communicated with you but some information is still pending. USPS First Class Domestic and International packages measure 5 in. wide and 7 in. long. USPS Priority Mail Domestic and International packages measure 5 in. wide and 10 in. long. 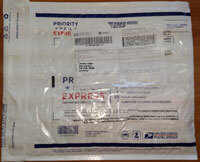 USPS Priority Mail Express Domestic and International packages measure 9.5 in. wide and 12.5 in. long. Express packages require an authorized signature upon delivery. No, we do not write NoseSecret anywhere on the package. We do not put any writing or any branding on the package. The shipping label will simply state "NS" as the sender. No one will be able to tell what is inside your package. Know what your package looks like. Check your address address before placing your order. Remember to include any apartment/unit/suite/room number if applicable. Make sure the name on your order matches the name on the mailbox. Packages may be returned to us without delivery if the mailman sees a different name on the mailbox. If you are living with other people, let them know that you are expecting a package. If you are living in an apartment building with a doorman/concierge/reception area, let them know that you are expecting a package. Make sure your mailbox is secure from theft. If the tracking information provided by United States Postal Service indicates your package has been delivered, we will consider your package as delivered, and there will be no replacement. *Please make sure to whitelist this email so it will not be marked as spam. All Domestic tracking numbers are in the form 9400110200821234567890.
International First Class and Priority Mail Customs ID numbers are in the form LZ123456789US. International Priority Mail Express tracking numbers are in the form EC123123123US. If you do not receive an email with your tracking number, it is possible that additional information is needed before we can ship your package. Please look out for an email requesting additional information. Or send us an email at customercare@nosesecret.com and provide your order #, and we will let you know why your package has not been shipped yet. *Only Priority Mail Express Domestic overnight delivery is guaranteed with exceptions (see USPS for details). No other shipping methods offer a guaranteed delivery date.